My daughter and I were leaving the library parking lot mid-afternoon today (it being my day off), when suddenly my cell phone rang. I did not recognize the number. “I think I have your statue,” said the voice at the other end. I took down her address and hung up the phone. After driving about a block I decided to call Susan, who had gotten the ball rolling with her Letter to the Editor and who would be better than I at making a positive identification of our statue. She couldn’t believe it! After swinging by Susan’s house to pick her up, the three of us drove out to the woman’s house, which was out past the edge of town. On our way, we passed the cemetery she had mentioned. She was waiting for us in the driveway. After we had introduced ourselves, she called into the house for her daughter and another woman to join us. 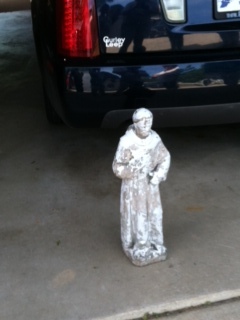 The daughter unlocked the trunk of her car, and there was St. Francis! Susan made a positive identification, which was complicated by the fact that the daughter had already started work on removing the peeling paint. Then we transferred St. Francis from her trunk to mine. As we were standing there in the driveway, the daughter told us more of the story. The friend who was purchasing a burial plot that day had been dying of cancer—that was why his insistence on her taking the statue from the dumpster was so important. He died shortly thereafter. He had been quite a jokester, and while standing in the cemetery, she suddenly had a vision of painting St. Francis pink and putting him at her friend’s grave. She was horrified, thinking she would never do such a thing to a statue of a saint, but she knew the deceased would appreciate the joke. She then couldn’t get the funny image out of her mind. She shared the image with her friend’s wife, who laughed and thanked her for lightening such a difficult day. Then, yesterday, our story appeared on the front page of the South Bend Tribune. The story included a photo John Zanka had taken a few weeks before the statue was stolen. Because of the angle of the shot and the time of day when the photo was taken, the faded and peeling brown paint on St. Francis really appears pink! Imagine her amazement at seeing this seemingly abandoned statue on the front page of the newspaper, reflecting her graveside vision! We thanked the women profusely, sharing with them our former concern that someone had taken the statue only to destroy it. We may never know how Francis made it from our garden to that spot next to the dumpster. What we do know, however, is that he made it into good hands and that he briefly lightened the burden of a grieving widow. Not bad work! 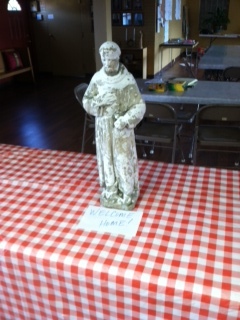 Francis has now made his way back to our parish hall, where he awaits important decisions like how to finish refurbishing him and how (or whether) to better secure his place in the garden. For now, we’re just happy to have him home again. My initial reaction was to be happy that one of our neighbors had motivation to pull what I was still thinking of as a weed from our garden. But once I was home, after the party was over, I got to wondering about how one went about eating purslane, ’cause there’s plenty to go around! 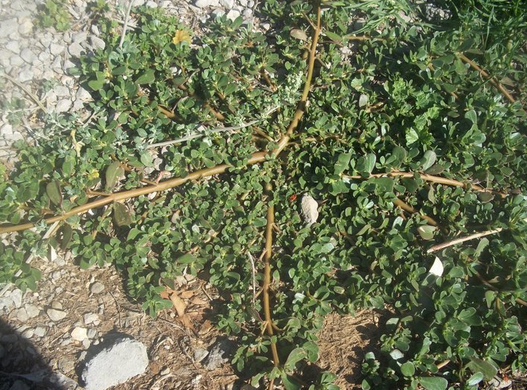 So, the next time you pull out some Purslane, you might not want to throw it away! Come one, come all, for a casual neighborhood gathering right in Holy Trinity’s backyard! This first event will focus on sampling some of the things we could do together as neighbors, while soliciting ideas from neighbors about what kinds of activities they would like to play a part in. So, while we will have materials and very brief presentations from different educational and social service groups who might present more substantial programs at Holy Trinity in the future, we will also have space for folks to list what kinds of presentations they would like to have. Likewise with music, crafts, food etc. . .
Our primary goal is to get to know our neighbors better, so do come and hang out in the backyard with us! Come out from 5–8 pm on Saturday evening to spend some casual time with your neighbors! 7pm Bible Study/Workshop: Identifying the Holy—the ability to listen closely to others and to help them recognize what God is already doing in their lives.